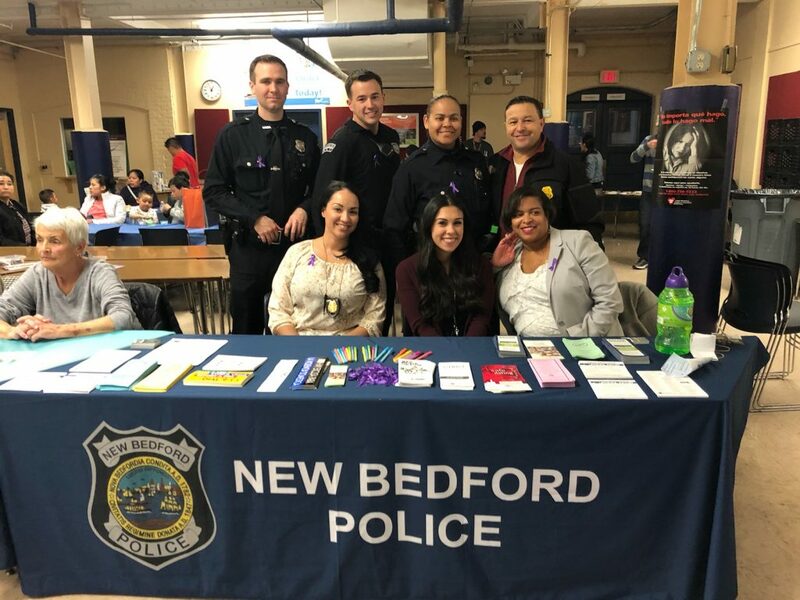 New Bedford Police came out in support of the Near North End Alliance’s “Healthy Community Day” held at the Global Learning Charter School on Saturday, March 16th. This event had several community partners on hand, with tables set up to provide a wide array of information and services. Our Family Services Unit had a table set up as well to provide support material and information. Pictured from left to right; School Resource Officer Thomas Chevalier of Normandin Middle School, Community Police Officer Jared Lizotte, School Resource Officer Leanne Fisher of New Bedford Vocational High School, and Chief Joseph Cordeiro. Seated from left to right; Detective Dominique Sherburne of our Family Services Unit, Domestic Violence Advocates Sarah Ferreira and Camille Anderson, also from our Family Services Unit.